Sometimes it feels daunting when there’s a therapy break ahead. Other times, therapy breaks can feel like a much-needed pause. Either way, therapy breaks – times when either you or your therapist are away – can offer great growth opportunities when handled well. 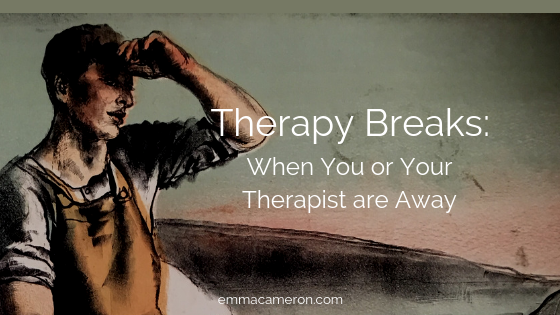 In this blog post I’m going to unpack some of the things you might think about in regard to a therapy break. And in Part 2, I’ll offer some tips and things you might talk about with your therapist, as well as things to do before and during the break. Equally, breaks can happen because a therapist is undergoing medical treatment, or has to take time out because of a family crisis. Therapy breaks also happen, of course, because your own circumstances have changed. Perhaps you have to spend time elsewhere temporarily, whether because of work, holidays, family issues, etc. (Although in many cases, your therapist may offer the option of online therapy or phone sessions). Side Note: It’s strange, but even when you are the one to require the therapy break (whether because you’re going on holiday, or for some other reason) you may still find yourself feeling angry at your therapist, and let down by him/her! Our unconscious mind tends to like consistency in attachments, and may well interpret a break as a failure of your therapist, even when your conscious brain knows full well that you were the one to require the break. Sometimes a therapy break can feel like a relief, a chance to slow down the hard work of self-discovery and change, and focus more on putting your new learnings into practice. It may feel exhilarating, like you’ve been learning to ride a bike and now the training wheels have been removed and you can venture out on your own, wobbling but getting more and more confident. However at other times it might be daunting for you as a therapy client to know that for a while you’re going to have to manage your therapist’s absence. You may not feel ready to go it alone. It may feel scary and overwhelming and you may wonder how you’ll cope without the structure and containment of your regular weekly session. If your therapist is planning a holiday or going on a training, you will know the date when you can expect to see him or her next. Other times it will be less clear, and your therapist won’t be able to precisely predict when therapy can resume. This may happen when there are hard-to-foresee things like your therapist’s return to health after an operation or illness, how things are going with their family commitments, or their recovery from a personal loss. (Because of course, therapists are like everyone else: we too can suffer bereavements, illnesses, or having to care for a sick relative, etc). One thing is certain: Breaks in therapy are significant. This may especially apply if your therapist is working in an attachment-oriented and trauma-informed way. And in therapy, significant things are best talked about. If you know about the break in advance, make sure you allow yourself to tune into your feelings and thoughts about it. If you sense that you do have feelings about the break, don’t try and pretend to yourself that it’s not happening, or that it doesn’t matter. And try to talk as honestly as possible with your therapist about it all. This way, the break itself (or more accurately, processing the break) can become a valuable part of your healing and growing in therapy. Because let’s face it – in what other relationship can you have a really heartfelt, honest conversation about all the mixed feelings you may have towards the other person (including love, dependency, hate and anger)? Daring to feel and express everything, and being heard and responded to from a non-defensive position, can be incredibly healing. Tempted to Miss a Session? It’s not uncommon for therapy clients to skip a session just before a therapy break. Your conscious reasons for missing your session (or wanting to) often seem sensible and grounded in practicalities. But skipping a session before a break is often linked to something deeper too. Maybe you’ve been feeling annoyed with your therapist and unconsciously wanting to deprive or punish him/her. I recommend that you make every effort to attend all the sessions in the run-up to the therapy break, so you can know you are facing things head-on and doing the work you came to do, even if it’s uncomfortable. Is it Okay to Reach Out to Your Therapist During a Break? It may – or may not – be possible, appropriate or helpful to reach out to your therapist during a break. Ideally the two of you will have been able to have a conversation about that before the break. Different therapists have different boundaries and expectations. However these may change depending on circumstances. For example, Anna, a therapist in Essex, was fine with occasional contact with her client Lee when she went away on holiday. But when her mum experienced a sudden acute health crisis and Anna had to rush down to Devon for a week, she really didn’t have the emotional bandwidth to be in contact with her clients. Luckily, Lee understood, and he and Anna were able to have a productive, honest conversation about this in their session following the break. There may be times during a therapy break when you really, really miss your therapist. When you urgently want to connect, and to let him/her know how you’re feeling or what you’re going through. The ‘dots text’ could be worth considering. With this arrangement in place, the client sends the therapist a text consisting simply of three or four dots; and the therapist at some point text some dots back. These dots represent connection and reaching out, as if to say “I am here, thinking of you; are you there?” No other words or emojis are used. Of course, the dots text, just like any other text, requires that you can tolerate waiting. After hours or on a weekend, or if your therapist simply doesn’t check their phone for a long while, you may have to be prepared to wait a few hours, or until the next day. Note: It’s crucial that you talk this through with your therapist ahead of time, so you’re both in agreement and have discussed potential difficulties, limits, etc. Not all therapists favour contact during therapy breaks, even minimal contact like a dots text. Many therapists prefer to keep all interactions between the two of you ‘in the room’. So no emails, no texts, no phone calls. This doesn’t mean your therapist doesn’t care about you, or has forgotten you. In many cases, sticking to boundaries like this can be part of what makes therapy effective. And effective therapy is definitely what you want, in the long run. Therapy breaks certainly aren’t all bad! They can be a great chance to practise and reconsolidate the skills you’ve been learning in sessions. It can feel exciting to ‘fly solo’ for a bit, and gather experiences that you can report on to your therapist after the break. In the therapy break, you get plenty of chances to work on developing your inner wise protector and guide. This is always a work in progress, and you’ll probably notice that it may seem like you take two steps forward, one step back (and sometimes, one step forward followed by two steps back). Notice moments when you are behaving lovingly and wisely towards yourself, and moments when you are aware of your heartfelt intention to be a kind inner guide to yourself, even if it feels hard or out of reach. And lastly, a reminder. If your therapist didn’t take breaks, he/she would eventually become burnt out and thus emotionally unavailable to you. Not what you’d want, really! And if you’re a thoughtful, sensitive person, I offer therapy in north Essex (CO7) and also online. Short-term and long-term psychotherapy and counselling available. For more details, see my therapy page. I also offer clinical supervision to psychotherapists and counsellors in Essex and online. What’s your experience? And do you have any tips or perspectives to share? Whether you’re a therapist or a therapy client (or both) please share your thoughts about therapy breaks, and any helpful suggestions, in the comments below.